Cards: Leaf Rookies & Stars 2006, Upper Deck 2006. 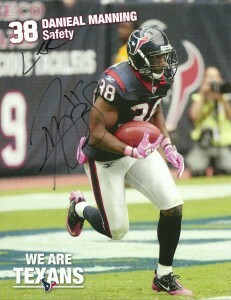 With Danieal Manning’s autographs on these two cards, I officially went over 1,000 autographs on cards. 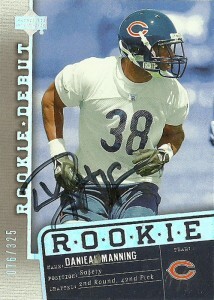 He jokingly balked at signing the cards originally when I produced them stating, ” Aww, man these are Bears cards! I thought you were a real fan!” I then produced these additional photos, which he was more than happy to sign and then did an about face on these cards telling me it was just a joke. He was able to tell me exactly where these photos were from, and the “Shhhh…” is from the Baltimore after he made a pick. 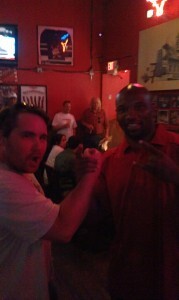 He also was cool enough to take a photo with me as well. Manning dominated at the college level for tiny Abilene Christian. In 3 years there, he compiled 159 tackles, 2 sacks, 4 forced fumbles, and 11 interceptions for 99 yards. In 2003 alone he’d record six of those picks, putting him on the national radar. Danieal, earned two All-American Selections in 2004 and 2005 for the Wildcats. A dangerous return man with breathtaking speed, Manning recorded 6 special teams touchdowns. 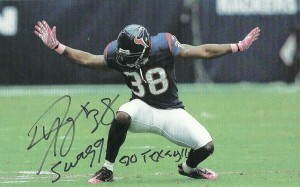 He’d hop to the NFL for the 2006 draft and the Bears took Danieal with the 42nd pick that year. Manning created quite a stir, as fans weren’t expecting him to be as talented at returning kicks as the dynamic Devin Hester, but they were in for a surprise, when Danieal did full-time duties in 2008. He’d return 36 kick offs for 1070 yards and a touchdown. His whopping 29.7 yard average led the NFL and he’d be named All-Pro after the season, despite starting only half the season. A strong pass defender and run enforcer, Manning made 9 picks, and 32 pass defensed in 6 seasons with Chicago from the Free Safety position to go along with 324 tackles and 7 forced fumbles. He’d get lost in the shuffle of Chicago’s defense in 2010 by breaking his foot, and was allowed to leave as a free agent for 2011 after rejecting an extension. 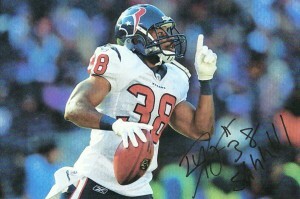 The Houston Texans were remaking their NFL history making worst pass defense in history from 2010. After being rebuffed by N’Mandi Asomugha, the Texans decided to go with a 1-2 combo of signing Johnathan Joseph from Cincinnati and Danieal Manning from Chicago. Manning and Joseph provided the Texans with an excellent combo for Wade Phillips to reshore Houston’s porous defensive alignment. Initially I was still sore about the team allowing vocal defensive leader Bernard Pollard go. He really came in and contributed to the team in 2009, but had just a subpar 2010, exposed in Frank Bush‘s defensive scheme. It didn’t take long for Manning to make an impression on the defense for me, and I knew they were in good hands with him protecting the backside. Starting 13 games in 2011, Manning recorded 52 tackles, 2 picks and a fumble recovery. Houston recorded a remarkable turn around on defense, moving from 4th most points allowed for 4th least points allowed. Manning also performed kickoff return duties with 13 KR for 356 yards and a 27.4 yard average. I had to really fight to get to the 1300 the Zone event downtown this time. It was the first event I had attended something in the Warehouse District in some time. The area has changed quite a lot. Dotted with expensive parking lots and shoddy attendant rules and prices, it was frustrating, but in the end worth it. I found a lot that charged 5 bucks and after getting change was able to jog a block to the event with about 30 minutes to go. Rod Babers greeted me at the door with a big smile and when he yelled out my name, all the fans in the room looked at me. It was odd being surrounded by all these old and new Texans fans. I had gotten used to cheering on the Texans during their darker days alone at restaurants, biting my tongue and savoring the small victories. Now it appears everybody wants a piece. Everybody has been a fan since day one. I’m not going to chide them. It’s nice to have a team that people like now, and I hope the Texans can keep up the positive vibes and good seasons to establish some brand loyalty with them. This event was a great start.